I am very excited to again be able to offer two exciting classes with JoAnn Kelly Catsos of Ashley Falls, MA. JoAnn has won numerous awards for her beautiful black ash baskets and in 1999 she was asked to weave an ornament for the White House Christmas Tree. She also was one of the first to receive the Certificate of Excellence Level I Basketmaking from the Handweavers Guild of America. JoAnn and her husband Steve produce all the weaving materials, hardwood rims and handles, and molds themselves. I hope you can join JoAnn and me for this exciting and fun workshop. 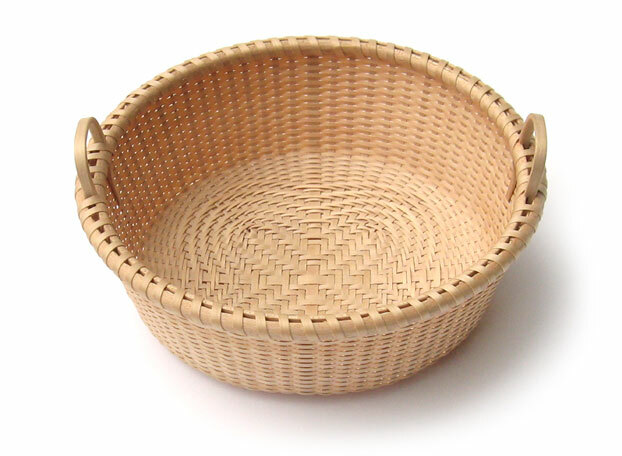 The small Shaker knife basket is a half-size replica of JoAnn’s classic 8" knife basket. This classic Shaker icon will be a great additional to your collection. This Shaker quadrafoil tub is based upon an antique Shaker tub at the Shaker Museum in Chatham, NY. The small stakes (3/32") and even smaller weavers (50/1000" and 1/16"), combined with the quadrafoil twill, makes this a challenging basket (but worth the effort). with quadrafoil twill experience necessary. Both baskets are included in the workshop.